We have prepared a very special offer for you! The best solution for traders in the forex market! 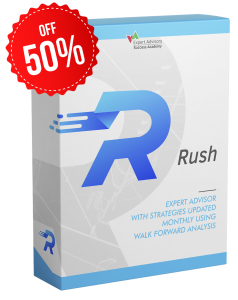 You can purchase the Expert Advisor (EA) Rush for only US$ 297 per a lifetime license, or acquire an exclusive package called EASA (Expert Advisors Success Academy) which includes EA Rush plus access to 5 other EAs, all developed by our professional team of traders and managers. Additionally, you will have access to unique risk management and EA selection tools, as well as to all new EAs developed by our team (we have been working on many promising new strategies that will be released soon! ).